‘Mad Men’ mania is taking over NYC this week, as the popular TV drama prepares to return to the small screen Sunday. To get prepped, the web has been overloaded with Mad Men articles and blog posts, but, what the heck, let’s add one more. One of the shows primary focuses is 1960’s fashion. They don’t spend too much time yapping about it, but they really don’t have to. Draper & Co. look great all the time, and everyone knows it. The show’s style has had a huge impact on designers and consumers over the past few years, and, thanks to the show’s soaring popularity, several retailers are carrying the ‘Mad Men’ inspired 1960’s business looks again. Popular brands such as Brooks Brothers, Calvin Klein, Club Monaco, J. Crew, Estee Lauder and Anthropologie have all taken cues from the show’s fashion in new lines directed at both men and women. 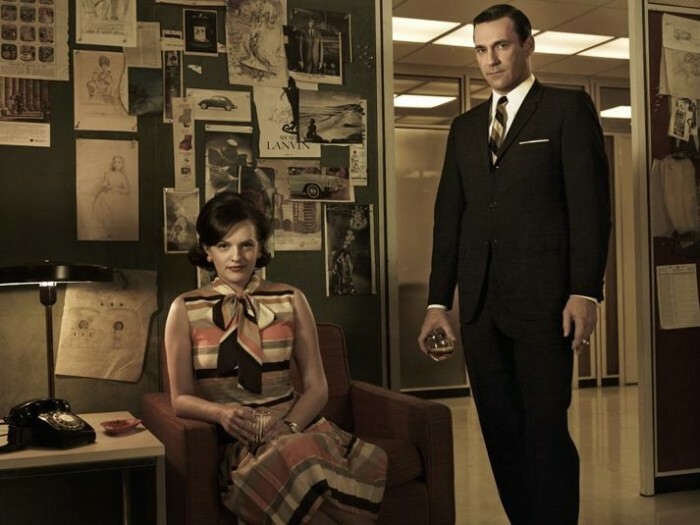 Leah Bourne notes in Forbes.com that the “indelible part” fashion plays in ‘Mad Men,’ combined with the show’s increasing popularity, has created what she dubs a ‘Mad Men’-effect in popular culture, a retro-leaning nostalgia that affects both men and women’s views on the consequences of modern and retro fashion. For men of the 1960s, a good suit was an essential item for even the most menial office worker, yet today, some of the world’s most successful businessmen get by in jeans and sneakers. Diversity has overcome, and now, it’s the value of a man’s ideas, not his wardrobe, that determines his merit in the business world. For women, the show paints a similarly complex picture, weaving through the shifting gender roles of the 1960’s when skin became more accessible and feminism’s second wave began to take hold. Women stepping up to play hardball with the boys is one of the show’s primary motifs, and this season’s new fashion trends, mini-skirts and pants, continue to push the conversation forward. As women take on responsibilities similar to their male co-workers, the show’s fashion aims to highlight the changing dynamic of gender and workplace relationships, and how women’s dress style emphasized their growing authority in the office. The show doesn’t paint the roles of fashion in either a positive or negative light, but instead leaves it to the viewer to settle the complexities. While we may long for the days of Marilyn Monroe and three-piece suits, we don’t want to step back into the 1960s’ exceedingly tilted gender roles. We’d like the style back, but maybe not all of the substance. This entry was posted in Fashion, Wardrobe and tagged diversity, fashion, forbes, gender, mad men, office. Bookmark the permalink.